The Coca-Cola brand used art installations to bring the design and movement of its water bottles to life. Coca-Cola’s Glaceau Smartwater is taking an artistic approach to reach people attracted to sophisticated design. The brand has taken over all 22 of the street-level windows at Toronto’s Fairmont Royal York hotel. 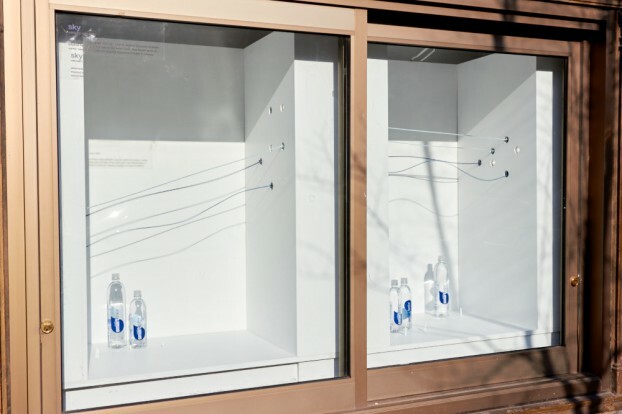 While most of them feature the brand’s standard OOH creative, in four of them, its agency Sid Lee worked with artist Mitchell F. Chan to create window installations, featuring rapidly vibrating coloured threads representing the movements of wind, sky and waves around bottles of Smartwater. Elsewhere, the brand is conducting a broader OOH campaign, which currently includes takeovers at high-traffic intersections in Toronto like Yonge-Dundas Square, Bloor and Church and a mural at King and Spadina. The OOH campaign has also been extended to Calgary and Montreal for December. UM is on the media buy, with Environics providing PR support. Daniella Macri, integrated marketing manager for Smartwater and Vitaminwater at Coca-Cola Canada, says the more traditional OOH featuring international spokesperson Jennifer Aniston highlights the product’s clean and crisp taste, as well as the “sleek design” of the bottle. While the OOH is slightly more product-focused, she says the installation at the Royal York hotel was a way to interpret both the design and the taste of the water through a more artistic lens. Macri says the main goal is to build awareness for the brand, with its current activations serving as a “preview” for another campaign it is planning for summer 2016.